. . . a really fine recording . . . with considered compositions and a ton of spirit. Elton Dean. Tim Berne. Tim O'Dell. 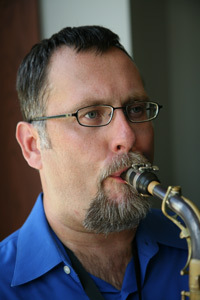 Welcome to the exclusive club of outstanding sax players/composers/improvisers . . . a perfect album . . . This disc is a great blend of composition and improvisation and it swings! . . . Before My Life has a uniqueness of vision. 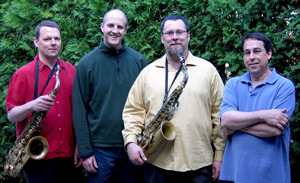 Makrokosmos Orchestra is a New York City-based large ensemble co-led by Maine-based composer/performers Tim O'Dell (saxophones) and Richard Nelson (guitar). Makrokosmos Orchestra brings together an exceptionally talented group of 14 mainly New York-based musicians into a uniquely configured ensemble. The group's wide-ranging sound pallet derives from its distinctive instrumentation: flutes, clarinets, French horn, and euphonium bring rich coloristic contrasts and shadings to their saxophone, trumpet, and bass trombone counterparts. Meanwhile, the rest of the group (guitar, bass, piano/keyboard/sound designs, hand percussion and drum set) flexibly contributes to the mix, serving at times as a creative, highly interactive contemporary jazz/creative rock/"world" music rhythm section, and at others as a "new music" ensemble's bass, percussion, guitar, and keys/sculpted sounds section, with many gradations in between. Nelson and O'Dell are complementary yet distinctly different composers, both working in the fertile boundary areas where contemporary jazz and classical composition and improvisation practices overlap, sparking fresh explorations of texture, compositional forms, and improvisational interactions. Their new compositions and arrangements for Makrokosmos Orchestra take full advantage of both the expressive range of this sonorous, vibrant ensemble and of the individual and collective improvisational talents of its outstanding personnel (including, among others, Adam Kolker, saxophone and clarinet; John Carlson, trumpet; Marshall Sealy, French horn; Yousif Sheronick, hand percussion; and Ken Filiano, bass, as well as O'Dell and Nelson themselves). Following is a listing of the exceptional personnel who make up the ensemble, and O'Dell's and Nelson's individual bios. 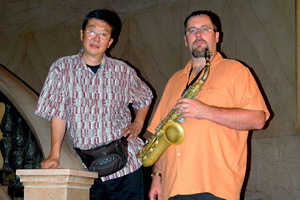 Tatsu Aoki and I have been performing and recording together in different venues since the early 90s. My friend, David Pavkovic, brought the three of us together at the Bop Shop in Chicago (Thanks Dave!). Tatsu, Dave and I soon became the Red Fire Ant Trio and performed and recorded around Chicago and the Midwest until 2001 when I moved to the east coast. We have released four albums together: Live in Iowa City (TOE, Inc.), Windy Christmas (IEL Records), Before My Life (Southport) and Finally Elijah	(Southport). Tatsu and I recently released our fifth album together, Ancient Pines, for Southport Records. I consider Tatsu a wonderful mentor and one of the greatest artists of our time. I feel privileged to work with him. When Matt Langley asked me to co-lead a quartet featuring bassist Jim Lyden and drummer Luther Gray (two of the most in demand and versatile musicians in the Northeast) I pounced on the idea and started composing with vigor. We have had a great time working up and performing our new music, which really expands the notion of the modern, piano-less quartet. We are looking forward to our debut CD release and some touring. O’Dell has a rich timbre and consistent vision . . . compelling terrain. Percussionist Kevin Norton and I and have played some exhilarating concerts and have discussed a NY project together - perhaps duo, perhaps larger . . . In addition to PURSUIT, Richard Nelson and I have plans for a NY chamber group.